I made this cake for my son Christopher's 17th birthday. It was DELICIOUS. but it turned out really well. Easy to make too. I frosted it with "Glossy Chocolate Icing" which I found in the same magazine. Really really good. 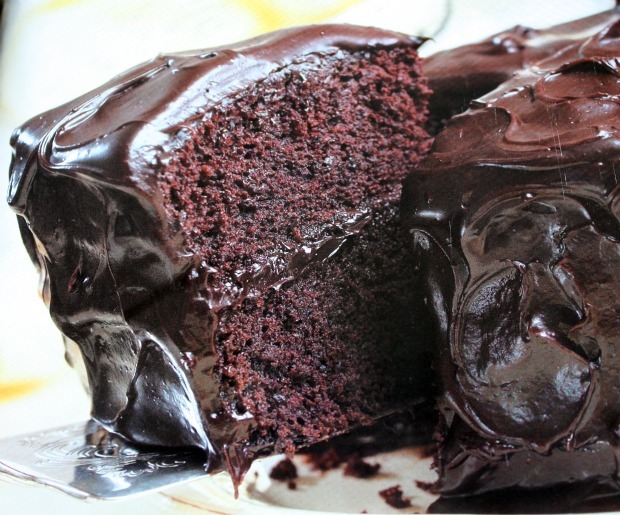 A definite "go to" if your craving chocolate cake. Combine the water, oil, vinegar, instant coffee and vanilla in a measuring cup. A few lumps are ok.
Pour it into your pans and bake. For the icing, melt the butter in a saucepan. 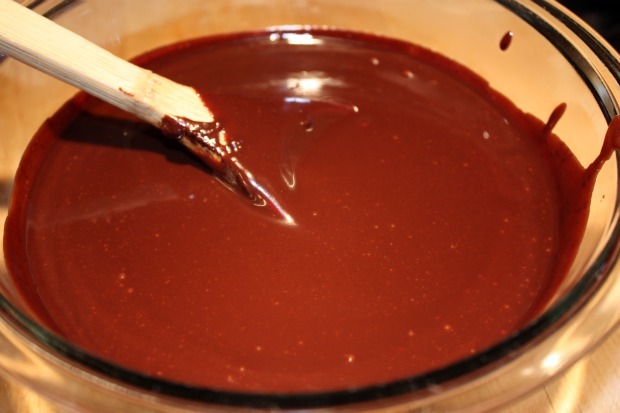 Stir in sugar, cocoa, and salt. It will look really grainy, like this. 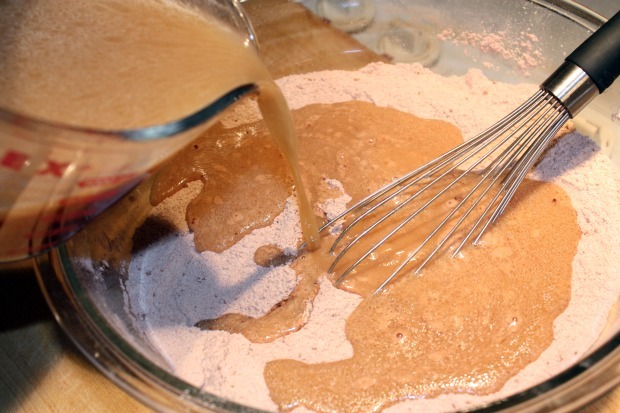 Gradually stir in the cream, sour cream and granules mixture and blend until smooth. Cook it until it's nice and hot, and the sugar is melted. Do Not Boil! It will look like this. Yum! 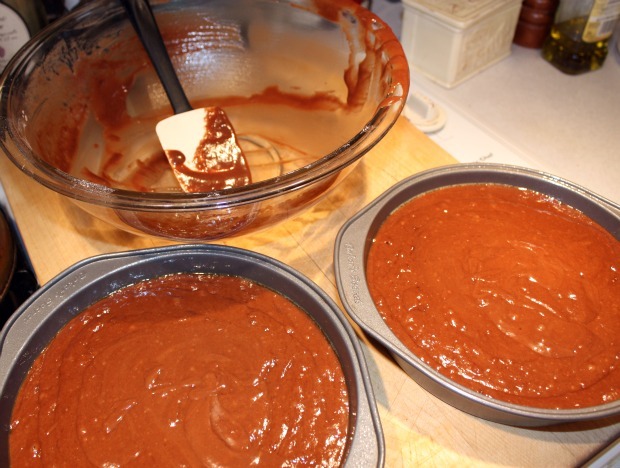 After the icing is cooled and thickened, the only thing left to do is frost your cake. Preheat oven to 350 with rack in the center. Spray two 8" round cake pans with nonstick spray. 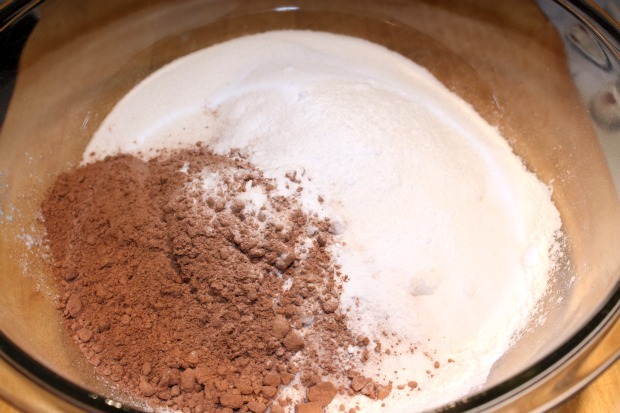 Whisk flour, sugar, cocoa, baking soda and salt together in a large mixing bowl. 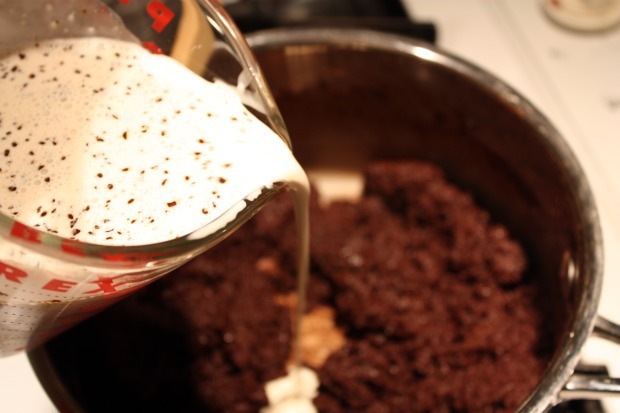 Combine water, oil, vinegar, instant coffee granules, and vanilla in a large measuring cup. Add to the dry ingredients and whisk until combined- a few lumps are ok.
Divide batter between the two pans, then bake until toothpick inserted in center comes out clean, 35- 40 min. *My cooking time was 25-30 minutes. Cool cakes for 15 minutes on a rack, then invert them onto the rack. Leave upside down (this flattens domed cakes) until completely cooled before frosting them. 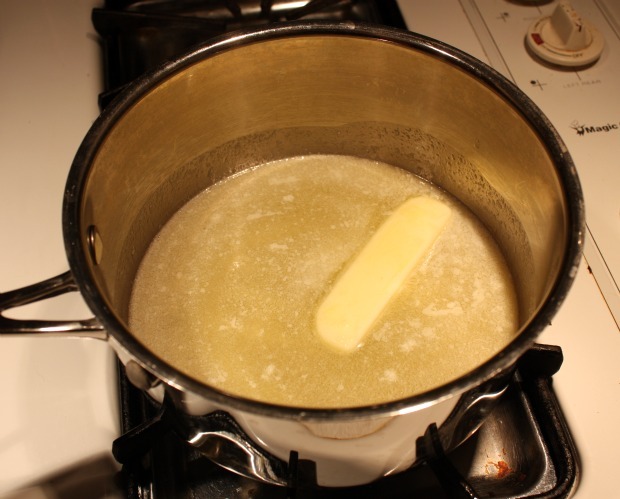 Melt butter in large saucepan over medium heat. 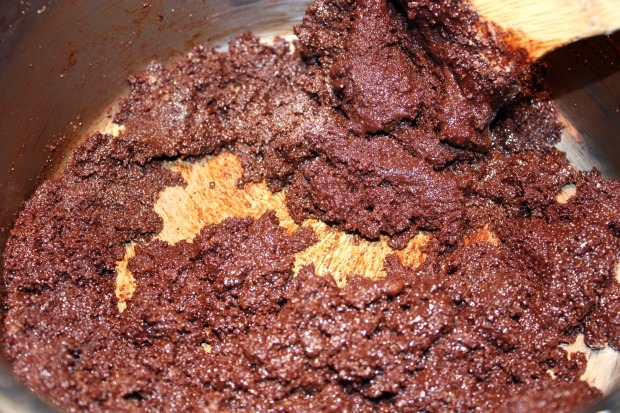 Stir in sugar, cocoa, and salt. Mixture will be thick and grainy. 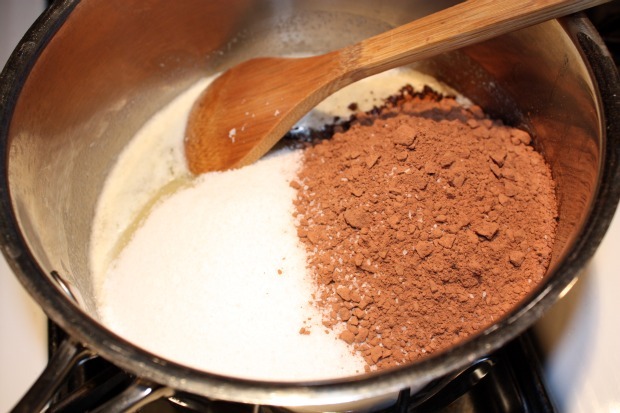 Combine heavy cream, sour cream and instant coffee granules in a large measuring cup, mixing until smooth. 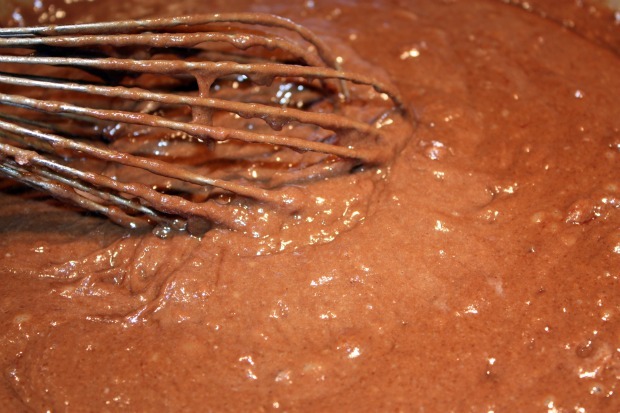 Gradually add cream mixture to chocolate until blended and smooth. 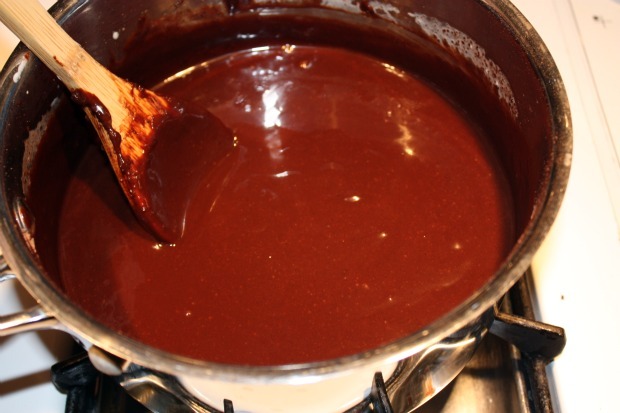 Cook until the sugar has dissolved and the mixture is smooth and hot to the touch. DO NOT BOIL. Take mixture off the heat, and add vanilla. Cool at room temperature until spreadable, 2-3 hours. (Icing may be chilled until completely cold, then warmed gently in microwave until spreadable. Heat at high power in 20 second intervals, stirring well after each interval. I gotta say, this was so easy. Give it a try and let me know what you think.